Makueni County has inked a three-year partnership deal with Heifer International, a United States non-profit Corporation with presence in Kenya, to fight hunger and poverty in the county. The deal aims at creating a framework for joint agricultural value chains development with key focus on dairy, poultry and beef value chains. According to Heifer International Country Director George Odhiambo, the partnership will seek to leverage on modern methods of livestock development geared towards increased farmer incomes. Some of the specific areas of partnerships include Research; Farmer trainings and capacity building; Linkage with financial services; Facilitating access to appropriate Technologies; Facilitating access to markets and Collecting, analyzing and monitoring data for decision making. The two entities will also utilize the local field extension systems to build the capacity of producer organizations and farmers to effectively integrate all factors of crop and animal production which includes breeding, water access, feeds, milk quality, animal health, farmer training and access to financing. 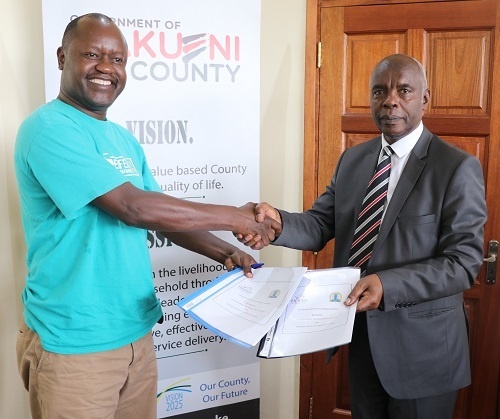 Governor Kivutha Kibwana who signed the MoU on behalf of the County government said it will assist in technology transfer through the county borrowing from Heifer’s Values Based Holistic Community Development (VBHCD) model. He said the deal will go a long way in creating jobs for youths, women while improving rural economies. Agriculture ECM Lawrence Nzunga who witnessed the signing said the county is in the process of establishing a poultry abattoir at Kitise and the partnership will enable its successful roll out and sustainability.